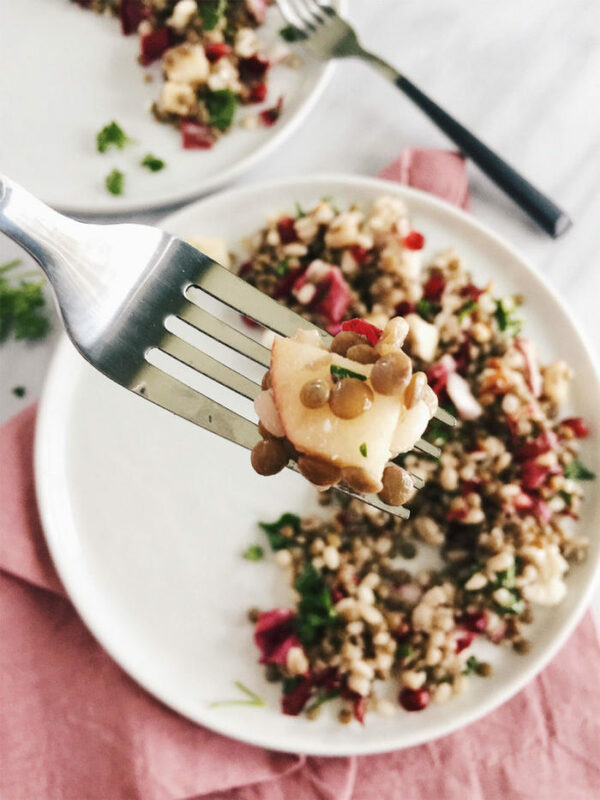 This Lentil and Barley Salad is a hearty and healthy grain salad—made with pomegranate, feta, and apples, and dressed with an Apple Cider Vinaigrette. As a child, I thought lentils were the most unseemly, slimy entities. I would wince as my grandmother and mom would eat lentil soup. I actually don’t believe I even tasted a single lentil until I was about 25. What was I so afraid of? I’ll never know. Lentils are delicious and the perfect conduit for creating a balanced and flavorful meal. They’re especially lovely in soups and salads, and the nutritional benefits are off the charts. This little legume is full of fiber, folate, magnesium, iron, and B vitamins. They’re an excellent source of protein (they actually come in third place for highest protein among all nuts and legumes). With 18 grams of protein per one cup serving, lentils get an A+ when it comes to plant-based protein. The high levels of soluble fiber found in lentils are great for heart health, lowering cholesterol, stabilizing blood sugar, and digestion. Lentils, you rock. I’ll pair you with a grain that also rocks: barley. I love barley because cup-for-cup, it has less calories and more fiber than quinoa, brown rice, millet, wild rice, or amaranth. It’s also full of manganese, selenium, iron, folate, vitamin B6, niacin, and magnesium. It gets high marks in protein, Omega-3 fatty acids, and dietary fiber. Barley also contains antioxidants, believe it or not, in the form of cancer-fighting, inflammation-reducing, and heart-healthy lignans. 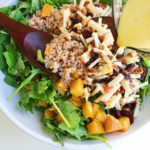 I love to make healthy grain salads. 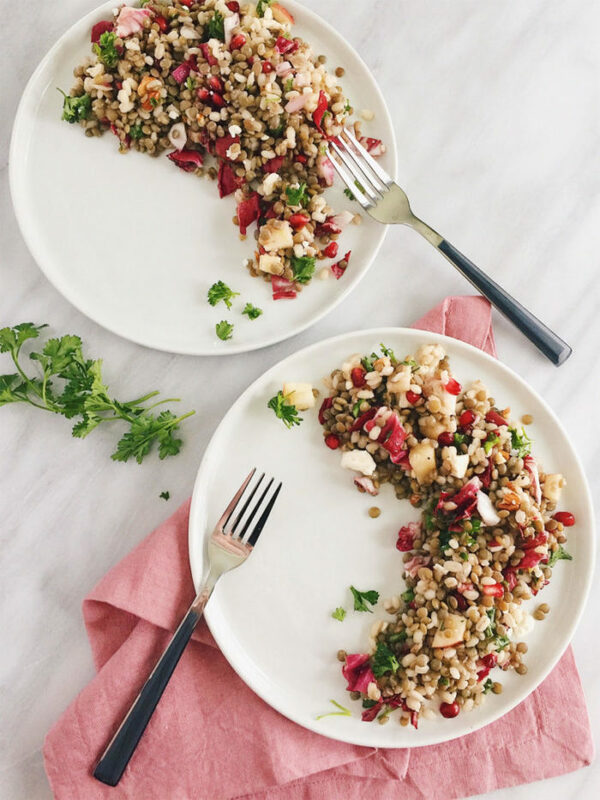 Due to high fiber content, hearty grain salads are an excellent choice when it comes to keeping you full and providing clean energy. Barley and lentils are both incredibly high in dietary fiber, which provides slow and steady clean energy. These complex carbohydrates (carbs rich in vitamins, minerals, and antioxidants) keep you fuller for longer and are more nutritionally dense than its simple carbohydrate counterparts (white bread and rice). 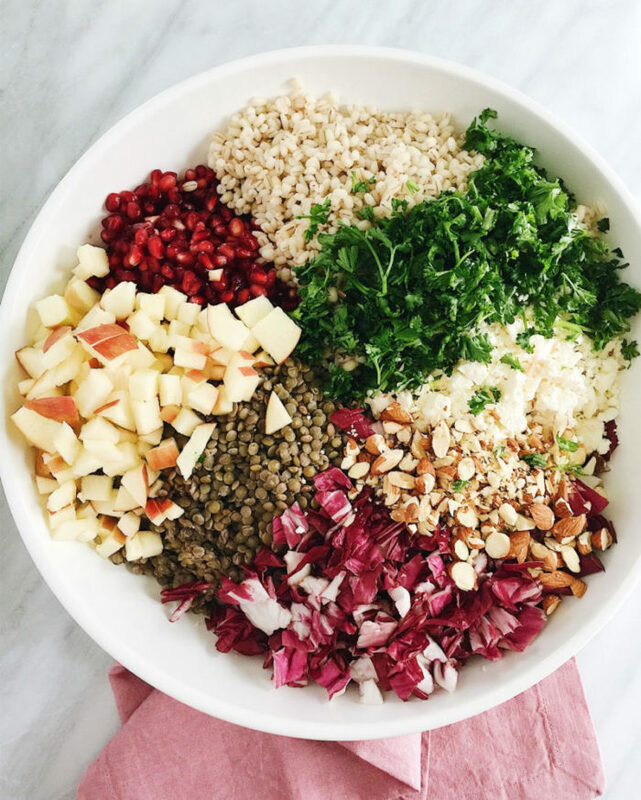 How colorful and pretty is this lentil and barley salad? It tastes as good as it looks, too. 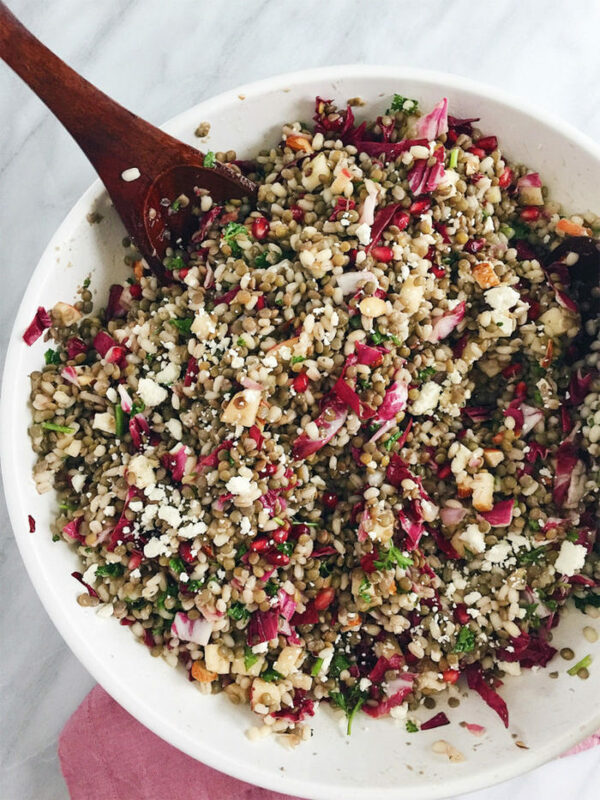 Pomegranate packs an antioxidant punch, radicchio adds a lovely balance to ensure this salad isn’t too sweet, and feta adds a creamy, salty bite. 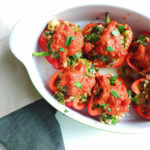 Apples impart a sweet crunch while parsley adds bright freshness. Nutty almonds and a tangy-savory Apple Cider Vinaigrette brings it all together. 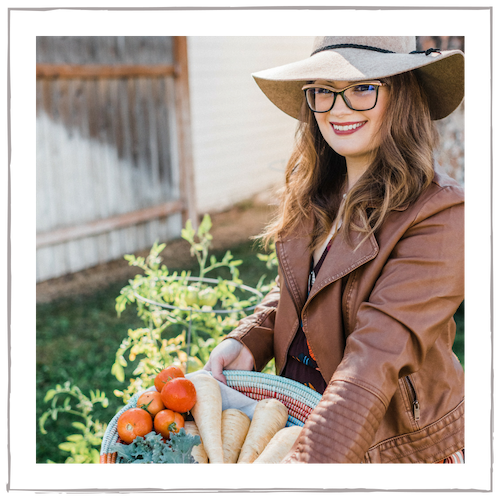 This post includes affiliate links but are always only products I highly recommend. Combine the lentils and barley with 5 cups of water, 2 cloves of garlic, and sea salt. Bring to a boil and then cover, reduce to a simmer, and cook until the lentil and barley are done, about 25 minutes. Drain, discard garlic cloves, and set aside to cool. Add the Dijon, shallot, honey, apple cider vinegar, olive oil, and sea salt and pepper (to taste) in a mason jar. Shake vigorously until emulsified and combined. 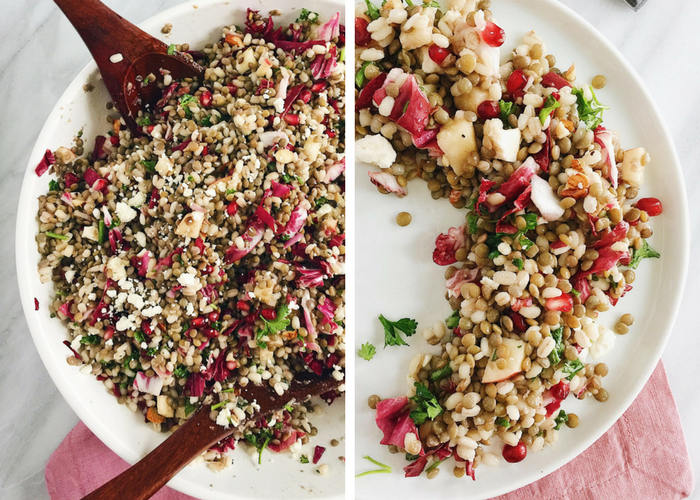 Combine the cooled barley and lentils with the pomegranate, feta, radicchio, parsley, apple, and almonds. Dress with the vinaigrette and toss thoroughly to combine. Serve cold or at room temperature. This makes a large amount of salad, so it’s perfect for a crowd, BBQ, party, or for meal prep for the week. 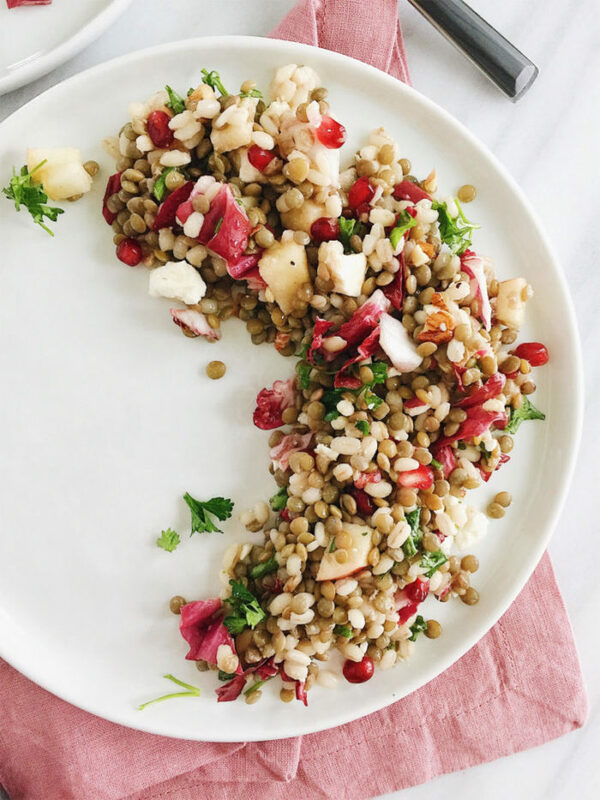 I am 42 and have never tried a Lentil, but this looks amazing! It looks crisp and light…and perfect for a summer salad! I am definitely going to have to give it a try! I am such a geek but I love lentils! Even as a little kid. So tasty. And this recipe looks insanely good. Thanks! I’m not lentils fan but this plate is colorful and amazing! It look so healthy. Bright and colorful. It looks delicious. I am not a picky eater since I was young but my brothers and sisters were. They would spit everything that was slimy. They still avoid it until this day. Oh this looks so tasty! Need to try making this myself. So colorful winter salad. This looks healthy. 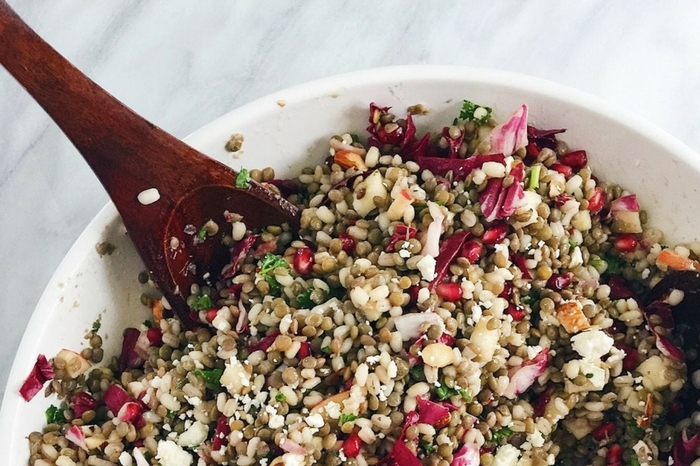 LENTIL, BARLEY AND FETA SOUND YUMMY. 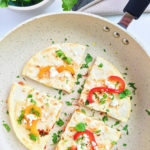 THANKS FOR THE RECIPE I WILL BE MAKING THIS! This looks absolutely delicious! will be adding to the grocery list for next week. Fabulous idea! I can’t get enough apple cider vinegar. It has so many health benefits. That plus feta cheese is a great combination. Wow this looks and sounds amazing! 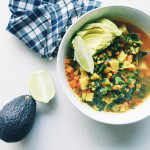 Lentils are so delicious, I need to try making a vegan version of this! 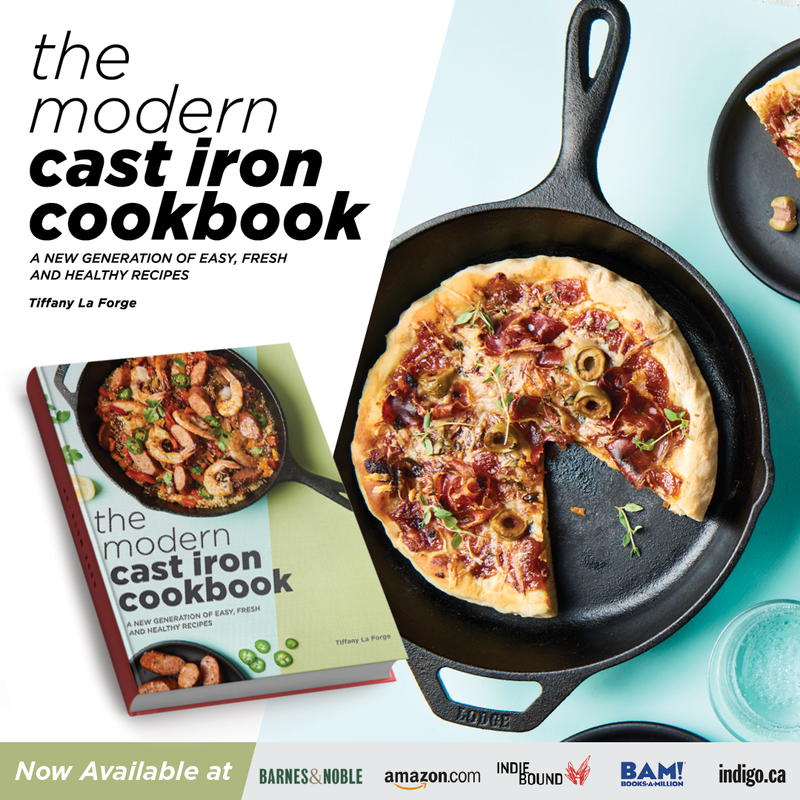 This is perfect for a spring meal. I love the ingredients in this healthy salad. I never eat this kind of salad. I need to try this, cause it looks so healthy. I couldn’t find pomegranate at the store, can I sub something else? Hey Mitzi, do you have a Trader Joe’s by you? They usually sell pomegranate seeds in their fresh produce section (refrigerated). If not, you can totally leave them out and just include the apples. You could also add dried cranberries or dried cherries in place of the pomegranate. That will add that nice pop of tangy flavor. You could also check for frozen pomegranate seeds. Looks sooo beautiful. Love the pomegranate and feta combination. 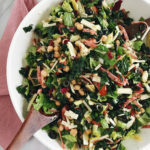 This is one gorgeous salad! 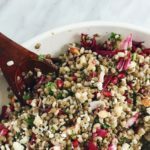 I’m a fan of lentils and barley, and sometimes they can seem heavy, but this salad makes them so light! 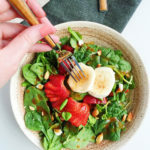 This salad makes me feel good inside, just looking at it! Very attractive and healthy. What a lovely winter salad! Love the pomegranate! I am in love with this salad!! So pretty and look delicious! This looks hearty and healthy, two of my favorite words that begin with “H”. Love these photos too!